Schnyder crystalline corneal dystrophy (SCCD) is a rare autosomal dominant stromal dystrophy that is characterized by bilateral corneal opacification, resulting from an abnormal accumulation of cholesterol and lipid. The causative gene for this disease is UBIAD1, which is present on 1p36. The gene is involved in cholesterol metabolism. 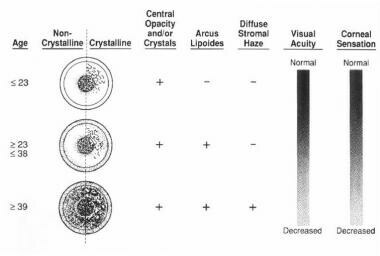 Please refer to the image below depicting the natural history of schnyder crystalline corneal dystrophy (SCCD) specific to age. The natural history of Schnyder dystrophy with age. Weiss JS: Schnyder's dystrophy of the cornea: a Swede-Finn connection. Cornea 1992; 11(2): 93-101. While the incidence in the general population is unknown, the world's largest pedigree (>200 patients with SCCD) has a Swede-Finn heritage and has been traced to the southwest coast of Finland on the Bay of Bothnia. However, the dystrophy has been reported in other ethnicities and in all racial groups. The pathogenesis remains unknown, but it is postulated to result from a localized defect of lipid metabolism. It has been demonstrated in affected corneas versus normal corneas that the cholesterol content increases 10-fold and the phospholipid content increases 5-fold. Immunohistochemical analysis has revealed the preferential deposition of apolipoprotein components of high-density lipoprotein (HDL), that is, apoA I, apoA II, and apoC, but not of low-density lipoprotein (LDL), that is, apoB. This finding suggests an abnormal metabolism of HDL in the cornea with SCCD. The recent discovery of the causative gene, UBIAD1, will be the link to further understanding of this disease. The gene produces a protein that contains a prenyltransferase domain that could play a role in cholesterol metabolism. In addition, UBIAD1 interacts with the C-terminal portion of apolipoprotein E (apoE), which is known to help mediate cholesterol removal from the cells. Further research will determine whether the excess cholesterol results from increased cholesterol production or decreased removal. The dystrophy has been reported in the United States, although the incidence in the general population is unknown. While the incidence is unknown, the dystrophy has been reported in eastern and western Europe, Taiwan, Japan, and Turkey. A long-term study of 33 families over a period of 18 years reveals that most morbidity derives from progressive corneal clouding, leading to glare and decreased vision in daylight. Mean Snellen uncorrected visual acuity (UCVA) was between 20/25 and 20/30 in patients younger than 40 years and between 20/30 and 20/40 in patients aged 40 years or older. Nevertheless, while scotopic vision remained relatively good, increasing corneal opacification with age resulted in decreased scotopic vision. Studies of those affected reveal that 54% of patients aged 50 years and older and 77% of patients aged 70 years and older had corneal transplant surgery. Although study numbers are small, there is no evidence of increased mortality from cardiovascular disease in SCCD. Of note, however, 71% of patients who had corneal transplant surgery reported the use of cholesterol-lowering agents. This was not statistically different from those patients who had not undergone corneal transplant surgery. SCCD can occur in whites, Asians, and African Americans. Although rare sporadic cases have been reported, SCCD is primarily an autosomal dominant disease, affecting both sexes with equal probability. The disease may appear as early as the first decade of life and slowly progresses with age. However, a diagnosis may be delayed until the fourth decade in patients with corneal opacification without crystalline deposits. Van Went JM, Wibaut F. Een zyeldzame erfelijke hoornvliesaandoening. Ned Tijdschr Geneeskd. 1924. 68(B):2996-2997. Schnyder WF. Mitteilung uber einen neuen Typus von familiarer hornhauterkrankung. Schweiz Med Wochenschr. 1929. 59:559-571. Weiss JS, Khemichian AJ. Differential diagnosis of Schnyder corneal dystrophy. Dev Ophthalmol. 2011. 48:67-96. [Medline]. Bron AJ. Corneal changes in the dislipoproteinaemias. Cornea. 1989. 8(2):135-40. [Medline]. Bron AJ, Williams HP, Carruthers ME. Hereditary crystalline stromal dystrophy of Schnyder. I. Clinical features of a family with hyperlipoproteinaemia. Br J Ophthalmol. 1972 May. 56(5):383-99. [Medline]. Delleman JW, Winkelman JE. Degeneratio corneae cristallinea hereditaria. A clinical, genetical and histological study. Ophthalmologica. 1968. 155(5):409-26. [Medline]. Freddo TF, Polack FM, Leibowitz HM. Ultrastructural changes in the posterior layers of the cornea in Schnyder's crystalline dystrophy. Cornea. 1989 Sep. 8(3):170-7. [Medline]. Gaynor PM, Zhang WY, Weiss JS, et al. Accumulation of HDL apolipoproteins accompanies abnormal cholesterol accumulation in Schnyder's corneal dystrophy. Arterioscler Thromb Vasc Biol. 1996 Aug. 16(8):992-9. [Medline]. Gibbels E, Schaefer HE, Runee U, et al. Severe polyneuropathy in Tangier disease mimicking syringomyelia or leprosy. Clinical, biochemical, electrophysiological, and morphological evaluation, including electron microscopy of nerve, muscle, and skin biopsies. J Neurology. 1985. 232(5):283-294. [Medline]. Gjone E. Familial lecithin cholesterol acyltransferase (LCAT) deficiency. Birth Defects Orig Artic Ser. 1982. 18(6):423-31. [Medline]. Hoang-Xuan T, Pouliquen Y, Gasteau J. [Schnyder's crystalline dystrophy. II. Association with genu valgum]. J Fr Ophtalmol. 1985. 8(11):743-7. [Medline]. McCarthy M, Innis S, Dubord P, et al. Panstromal Schnyder corneal dystrophy. A clinical pathologic report with quantitative analysis of corneal lipid composition. Ophthalmology. 1994 May. 101(5):895-901. [Medline]. Orr A, Dube MP, Marcadier J, et al. Mutations in the UBIAD1 gene, encoding a potential prenyltransferase, are causal for Schnyder crystalline corneal dystrophy. PLoS ONE. 2007 Aug 1. 2(1):e685. [Medline]. Philipson BT. Fish eye disease. Birth Defects Orig Artic Ser. 1982. 18(6):441-8. [Medline]. Rodrigues MM, Kruth HS, Krachmer JH, et al. Unesterified cholesterol in Schnyder's corneal crystalline dystrophy. Am J Ophthalmol. 1987 Aug 15. 104(2):157-63. [Medline]. Theendakara V, Tromp G, Kuivaniemi H, et al. Fine mapping of the Schnyder's crystalline corneal dystrophy locus. Hum Genet. 2004 May. 114(6):594-600. [Medline]. Vesaluoma MH, Linna TU, Sankila EM, et al. In vivo confocal microscopy of a family with Schnyder crystalline corneal dystrophy. Ophthalmology. 1999 May. 106(5):944-51. [Medline]. Weiss JS. Schnyder crystalline dystrophy sine crystals. Recommendation for a revision of nomenclature. Ophthalmology. 1996 Mar. 103(3):465-73. [Medline]. Weiss JS. Schnyder's dystrophy of the cornea: a Swede-Finn connection. Cornea. 1992 Mar. 11(2):93-101. [Medline]. Weiss JS. Visual morbidity in thirty three families with Schnyder’s crystalline corneal dystrophy. Transactions of the American Ophthalmology Society. In press. Weiss JS, Kruth HS, Kuivaniemi H, et al. Mutations in the UBIAD1 gene on chromosome short arm 1, region 36, cause Schnyder crystalline corneal dystrophy. Invest Ophthalmol Vis Sci. 2007 Nov. 48(11):5007-12. [Medline]. Weiss JS, Rodrigues MM, Kruth HS, et al. Panstromal Schnyder's corneal dystrophy. Ultrastructural and histochemical studies. Ophthalmology. 1992 Jul. 99(7):1072-81. [Medline]. Weller RO, Rodger FC. Crystalline stromal dystrophy: histochemistry and ultrastructure of the cornea. Br J Ophthalmol. 1980 Jan. 64(1):46-52. [Medline]. Wu CW, Lin PY, Liu YF, et al. Central corneal mosaic opacities in Schnyder's crystalline dystrophy. Ophthalmology. 2005 Apr. 112(4):650-3. [Medline]. A 22-year-old woman with circular corneal opacity best seen in retroillumination. Weiss JS: Schnyder's dystrophy of the cornea: a Swede-Finn connection. Cornea 1992; 11(2): 93-101. A 20-year-old woman with ringlike deposition of anterior stromal cholesterol crystals. Weiss JS: Schnyder's dystrophy of the cornea: a Swede-Finn connection. Cornea 1992; 11(2): 93-101. A 37-year-old man with central disclike opacity, affecting the entire stromal thickness, anterior stromal cholesterol crystals, and peripheral arcus lipoides. Weiss JS: Schnyder's dystrophy of the cornea: a Swede-Finn connection. Cornea 1992; 11(2): 93-101. A 78-year-old woman with dense arcus lipoides in the corneal periphery, sparing the corneal scleral limbus. Weiss JS: Schnyder's dystrophy of the cornea: a Swede-Finn connection. Cornea 1992; 11(2): 93-101.